Concept testing finds out people’s reactions to proposed products or advertising. You show respondents your ideas and explore their reactions. You find out their perceptions, opinions, beliefs, and desires about your concepts. You test product, service, and advertising ideas. A test is a preliminary screen. You sort out the good ideas from the bad, based on reactions. You screen ideas before you spend much time and money developing products or advertising. In new product development, present your new product ideas to prospects. Watch and listen to how prospects react. They tell you what they like and dislike. In advertising and creative development, present ads to prospects. Prospects react to headlines, copy, and images. They tell you what words and images they like, and the ones they dislike. They tell what they don’t understand. Show people your concepts and interview them. Respondents read, watch, or listen to concepts. Then ask them to interact with the concepts. There are several ways to show concepts. A concept statement is a written description of a new product or service. It is less than one page, usually a paragraph or two. It is a factual description of a product or service and its features. Images, pictures, or illustrations usually accompany the concept statement. Product samples are working products or nonworking models. Respondents see and touch the sample. Advertising copy are samples of proposed ads. Ads consist of headlines, body copy, and images. Ads are print, video, or audio. With written concept statements and print advertising, you get people to interact with the concepts. You ask them to write about the concepts. Circle words, phrases, and sentences they like. Cross out words, phrases, and sentences they dislike. Place questions marks on things they find confusing. Rate how unique and different the concept is. Give an overall grade to the concept… A, B, C, D, F.
Rate how likely they would buy. Estimate how much they would pay. After respondents mark up concepts, examine their markups to gain deeper understanding. Then follow up and probe. With video, audio or product samples, give respondents a survey. Hand out the survey when you show each concept. You also follow up and probe, as in concept statements. Introduce concepts right at the beginning of an interview or focus group, after the introduction to the interview. Ask respondents to write before they talk. That way, you will cut down on bias, which is a slanted, skewed, or influenced view. You reduce group bias and reference bias about concepts. In focus groups, some respondents influence other respondents. When you introduce concepts at the beginning, and ask people to write before they talk, you avoid group bias. When you conduct depth interviews, you don’t have to worry about group bias. But when you conduct depth interviews, you need to reduce reference bias. Respondents develop a frame of reference from a question or discussion. They carry the reference to the next question. The reference influences answers. Cut out reference bias by introducing concepts at the beginning of the depth interview. Let respondents write before you and let them talk about substance. Sometimes you have more than one concept to show. When you finish talking about the first concept, you move to the next one. But previous concepts are another form of reference bias that influence respondents. To reduce reference bias with several concepts, rotate the order of the concepts with each interview. Rotating order reduces bias. Three concepts in a focus group or depth interview are about the limit. Too many concepts produce concept fatigue in the respondent. Another way to reduce reference bias is to show only one concept in an interview. This is monadic testing… a dry research term for a single concept test. If you have several concepts to test, and you show a single concept in a depth interview, you need several interviews. And that pushes up costs. What people say and do are often different. Statements and actions often contradict each other. Concepts and concepts are abstract; they are easy to talk about. When respondents finish talking about concepts, concepts vanish from their minds. They evaporate. Concepts don’t require respondents’ commitment. They don’t pay for concepts and don’t use them. So, be wary about concept reactions and answers. Be on guard for overstatement in qualitative marketing research. Dig deep, challenge, and weigh what you see and hear. Don’t let rosy answers carry you away. Don’t use concept tests for forecasting sales. Be skeptical. Be a detective. Investigate some more. Once you’ve screened good concepts, use them to develop and test products. Product usage is the decisive test. The same holds true for ads. The only real way to know if ads sell is to test and measure them in a market test. 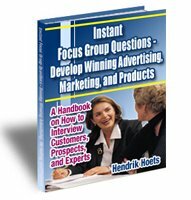 Use focus groups or depth interviews for concept testing. They are a preliminary screen and generate new perspectives.